STURBRIDGE, Mass. 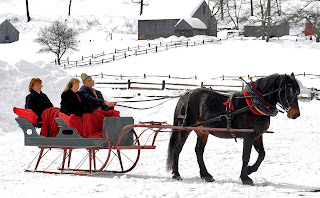 (Jan. 16, 2012) – Old Sturbridge Village celebrates the history and the joys of horse-drawn sleigh driving with an old-fashioned sleigh rally on Sat. February 4. Antique horse-drawn sleighs – many of them 80-120 years old – will converge on the Village for the sleigh rally, which will begin at 11:00 a.m. and will feature dozens of drivers competing in a variety of categories, including the popular “Sleigh Dog” and “Currier & Ives” divisions. The event is open to the public and free with museum admission. Watch the OSV Sleigh Rally video; for all details call 800-SEE-1830, or visit www.osv.org. 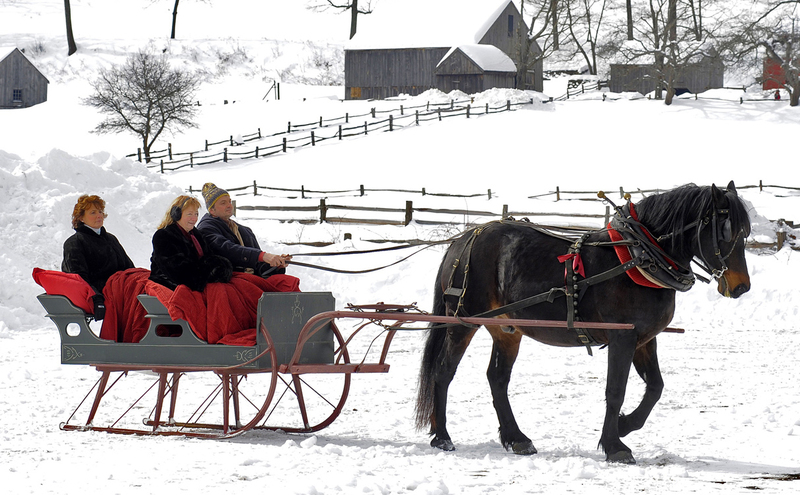 A variety of horses and drivers will be represented at the Old Sturbridge Village Sleigh Rally. At last year’s event, breeds included Haflinger, Standard Bred, English Shire, Gypsy, Clydesdale, Icelandic, Regular Mini, Morgan, Iberian Warm Blood, Pinto, Welsh, Arabian, and Friesian. Competition classes will include Pleasure Draft – Single Hitch; Pleasure Mini – Single Hitch; Pleasure Pony – Single Hitch; Pleasure Horse – Single Hitch; Sleigh Dog – All Hitches; Multi Hitch (Mini and Pony); Multi Hitch (Horse); Currier & Ives (Mini, Pony, Horse, and Draft Horse); Junior to Drive; Ladies to Drive; and Gentlemen to Drive. Sleighs participating will most likely include bob sleighs, Portland and Albany cutters, racing sleighs, freight sleighs, and more. Bob sleighs have “bobs,” which are double runners that make them more maneuverable and easy to turn sharply. Single runner sleighs can tip over if turned too sharply. Other winter activities at Old Sturbridge Village include ice skating (bring your own skates), horse-drawn sleigh rides around the Common, and sledding on 1830s-style sleds (weather permitting). After enjoying the museum’s outdoor winter activities, visitors can warm up indoors beside one of the Village’s many cozy fireplaces and take part in hands-on crafts and activities. Children can also spend time “pretending” in Old Sturbridge Village’s popular “KidStory” indoor play area. Old Sturbridge Village celebrates life in the 1830s, and is one of the country’s largest living history museums. Located just off the Massachusetts Turnpike and Routes I-84 and 20 in Sturbridge, Mass., the Village is open year-round, but hours vary seasonally. Winter hours are Wed. - Sun. 9:30 a.m. – 4:00 p.m. (the Village is open on all Monday holidays); Beginning March 31, 2012, the Village will be open seven days a week. Admission is: $24 for adults; $22 for seniors; $8 for children ages 3-17; children under 3 are admitted free. Each admission includes free parking and a free second-day visit within 10 days. Woo Card subscribers get 25% of adult daytime admission; college Woo cardholders receive 50% off adult daytime admission. For event details, visit www.osv.org or call 800-SEE-1830.